Erosion has had a monumental impact on the character of the wines of Burgundy. It took several decades once the INAO began preventing exogenous soil additions (early 20th century), before growers slowly began to realize that they must change the way they work their fields. They could no longer hit reset, by bringing in new soil to fix what they had damaged through poor farming practices. The vineyards have since responded positively; with increasingly healthier soils, and far better soil retention. The region is now producing the finest wines in its long history. But without a doubt, the erosional damage of the past has been so immense and irreparable, that we will never really know what the terroir of Burgundy might have been. How long ago this happened, will certainly surprise you. With the recession of the Ice Age, the Neolithic hunter-gatherers of the region were now free to venture northward, allowing the arrival of agricultural Neolithic man in central France, 6,500 years ago. 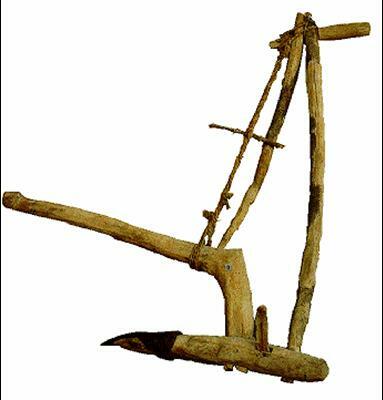 Around that time, the first plows were developed, and with the economy of effort it provided, more food could be produced. 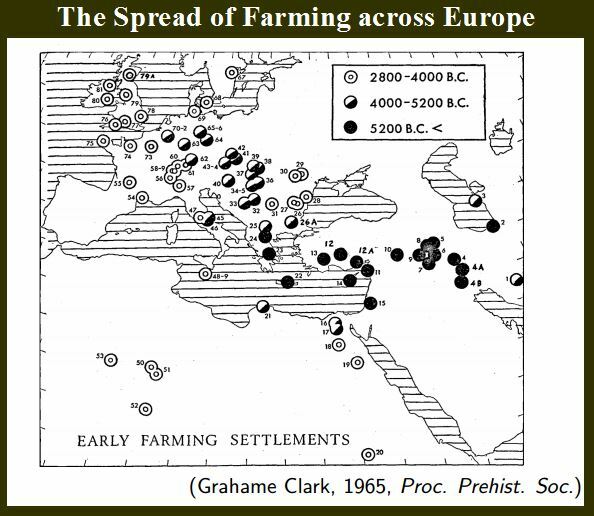 This in turn allowed the population to grow, greatly increasing the need for arable land. To meet that demand, they burned to clear forests for pasture and fields. This was an expedient means of what would otherwise take years of work. The unintended consequences of burns to facilitate clearing, were often massive, fast-moving wildfires that swept though forested and grassland areas. Without the protection of trees and grasses upon the hillsides, the erosion that ensued was monumental. There may have been more erosion in the 700 years Neolithic man farmed the land of central Europe, than in the preceding 35 million years since the Côte d’Or was formed, and perhaps more than all of the time since. Although through intervening centuries have seen the reforestation of the hillsides, the damage done by Neolithic man permanently changed the landscape of France. What did Neolithic man look like? Click here. Since the Neolithic, two subsequent periods of deforestation occurred, each time followed by large-scale erosion. The least destructive of the two was the periods between the 12th and 15th century, which despite the black plague in the middle 1300s, saw a large population growth in France. The king, or the Duke in Burgundy’s case (1), would grant large parcels of land from the royal demesne (domaine) to his nobility, who were considered the servants of the Duke. Known as seigneurs, the nobility, would then use the land to raise money to fund the Duchey. The seigneur granted strips of land to tenants (serfs) to farm in open fields. These fields where then were farmed communally by the inhabitants of the manor. Intermixed with the tenant parcels were the demesne of the seigneur, and the demesne of the church – all of the land which was worked by the surf communally as partial payment for their tenant rights. The rights the tenants had to the land were very strong and generational. They could not be evicted from the land by the seigneur. Additionally, the tenants were able to accumulate rights to more than one strip of land, meant parcels could be scattered across the manor. A transfer of land rights typically happened when a tenant died and had no heirs. At that time another tenant would assume the right to work that parcel. This occurred on a massive scale in the wake of the black plague, which arrived in Lyon in 1348. Lyon, which was only 155 km, or 96 miles along the main highway, the Via Agrippa, from wine villages of the Cote d’Or. There is little doubt that the plague struck the Cote d’Or very hard. Newcomers to the manor who had no land rights worked for tenants that had more land than they could work themselves. 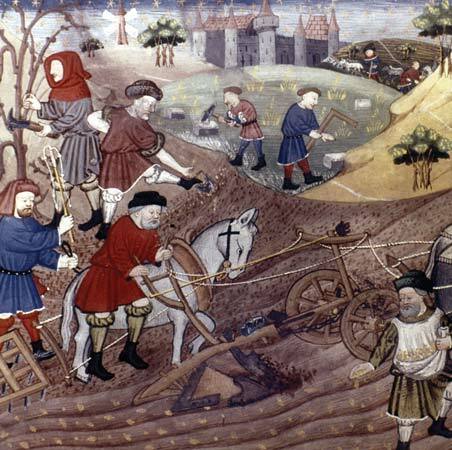 It is estimated that half the of the agricultural community consisted of landless serfs. The manor model, with its communal farming, required everyone to adhere to the norms of the region, and this discouraged innovation and adoptions of new techniques, causing production per hectare to lag behind farms in England, Holland and elsewhere in the world. The farmer’s dependence on the communal sharing of prohibitively expensive horses and plows needed to farm the heavy clay soils of central Europe only reinforced the status quo. The inefficiencies of farming under this system meant that as the population grew, it required that the economy remained primarily both rural and agrarian. The existing estates could not supply enough food if population grew mainly in urban centers, so population tended to grow in rural areas. More mouths to feed, and more able hands to employ, meant economic opportunity for the Duchy if new arable land could be developed from the forests. Even though the open field system inherently discouraged innovation and suppressed productivity, the system proved to be so economically successful its existence eclipsed the time of feudalism. Right up to the revolution, the open field system to continue to fund well-heeled landowners in this very capitalist endeavor. But even then, to say the open field system was gone, might be an incomplete truth. The people may have then owned the land, but their situation had not greatly changed. 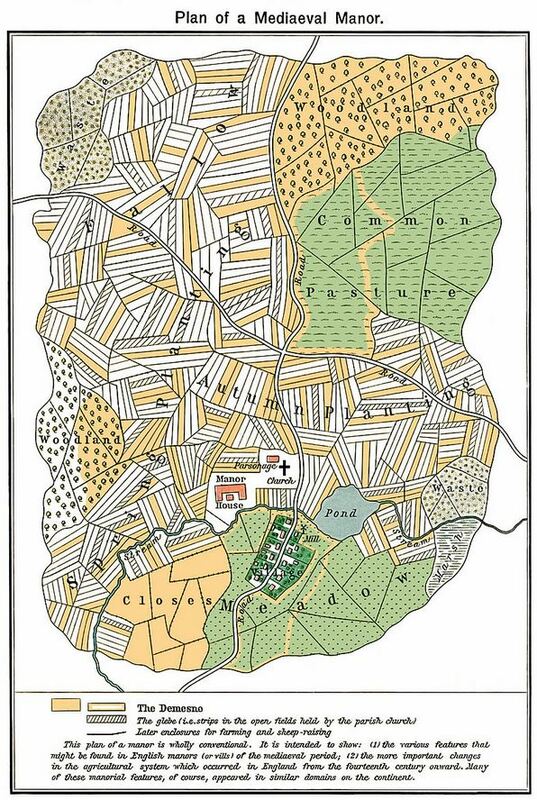 In fact, until only recently, the wide-spread division of small parcels ensured the impoverishment of paysans across Bourgogne-Franche-Comté, with an obvious, strong parallel to the medieval tenant arrangement. Indeed, the old lord-tenant arrangement of métayage (sharecropping) would reemerge. post-1789 revolution, between those who owned the land, and laborers who would work it. In 1929 there were 200,000 Métayers in France, farming the same 11 percent of agricultural land. This was truly not so differently as had been the arrangement in 1729, or in 1529 for that matter. As with a population that doubled in the 3 centuries after 1000 AD, the needs for timber and hardwood also increased. Wood was needed for construction, woodworking, iron smelting and metal working, not to mention fuel for heating. All of these needs multiplied the pressures on deforestation. Although forest management had to various degrees been practiced, it tended to be exercised on forests on properties owned by the aristocracy and the church. Elsewhere, woods fell to the ax and saw. A devastatingly cold 17th century followed, slowing the population growth and economies. The end of that century saw the failed harvest of 1693, when the death toll, according to David Huddart, and Tim Stott of Europeans is thought to have numbered in the millions. This period of economic lull set the stage for a final epoch of deforestation and erosion of France. By the mid 18th century, the average temperature had risen enough to achieve food security. Once again, with food in their bellies, populations rebounded, and focus on innovation brought healthy economies. Industrial development ensued, bringing expansion and colonialism. Massive fleets were built, from forests felled for the needed timber. As the population grew again, farming and pastureland expanded once again to support the needed food supplies. The open field system prevailed through this period, and given their inefficiencies, yet more land was needed to feed the population. To these pressure, the forests fell away, leading to erosion. Unlike the medieval period that saw erosion primarily because of deforestation, this dawn of industrialization created many new erosional sources. Iron works and foundries required mines and open pits to be dug to excavate ore, while limestone, prized for its hardness, was quarried across the country, including within the vineyard land of the Cote d’Or. It was the wealth of the times that created a demand for Burgundy’s limestone. Thousands of large building projects: for the Church, wealthy private citizens, the aristocracy, for government buildings and public works, all of which required vast amounts of building materials. The high demand created such soar value for the “marble”. I had originally concluded when first writing this article, that the value of the limestone below, outsized the value of the grape production of that location, but I have since come to what I believe to be a more valid conclusion. 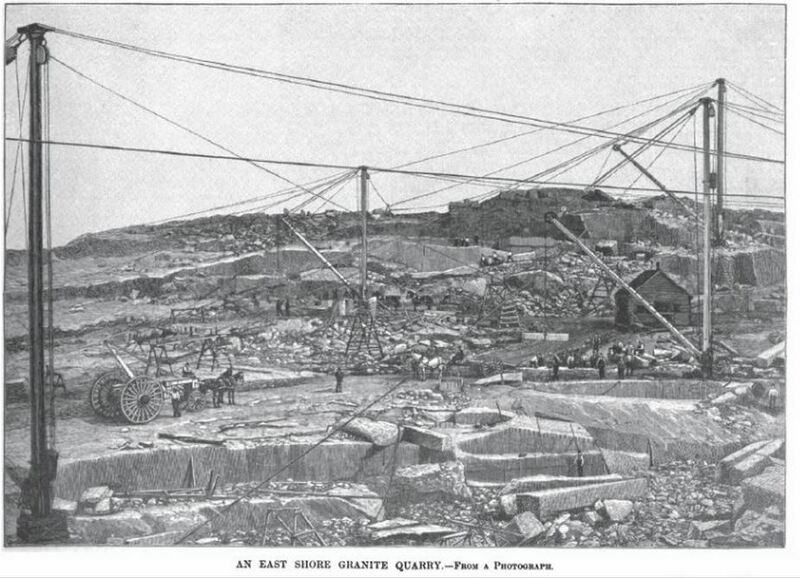 I submit that the quarries dug in locations in which the limestone remained unfractured, examples of which can be seen in the climates of Meursault Perrières, Clos de Beze, Bonnes-Mares, and some submit, even Romanee-Conti, made those particular locations unsuitable for quality vine cultivation, unlike the superb plots which surrounded them. It was used in its solid slab form for wall paneling and floors, but the rubble was also burned in special kilns to produce Quick lime (calcium oxide) which is the primary ingredient of both mortar and plaster. Softer limestones were often sought for the production of quicklime, as it was far easier to excavate the softer stone than the harder, unfractured stone which was required for floors and wall paneling. The excavation of the limestone not only changed the substratum and topography of these vineyards, but greatly affected vineyard lands to either side of these projects, and with substantial impact to the vineyards below. This is where the overburden (the topsoil and useless rubble) was cast, in the most expeditious manner, downhill. 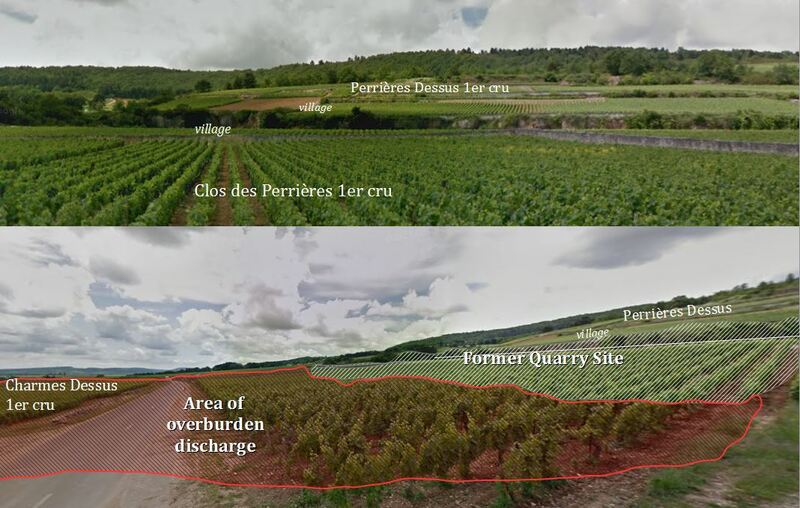 175 years later, the disruption of such a quarry site to the terroir of the region is easily seen in the two vineyards of Les Perrières in Meursault, and Les Charmes, which lies just below. 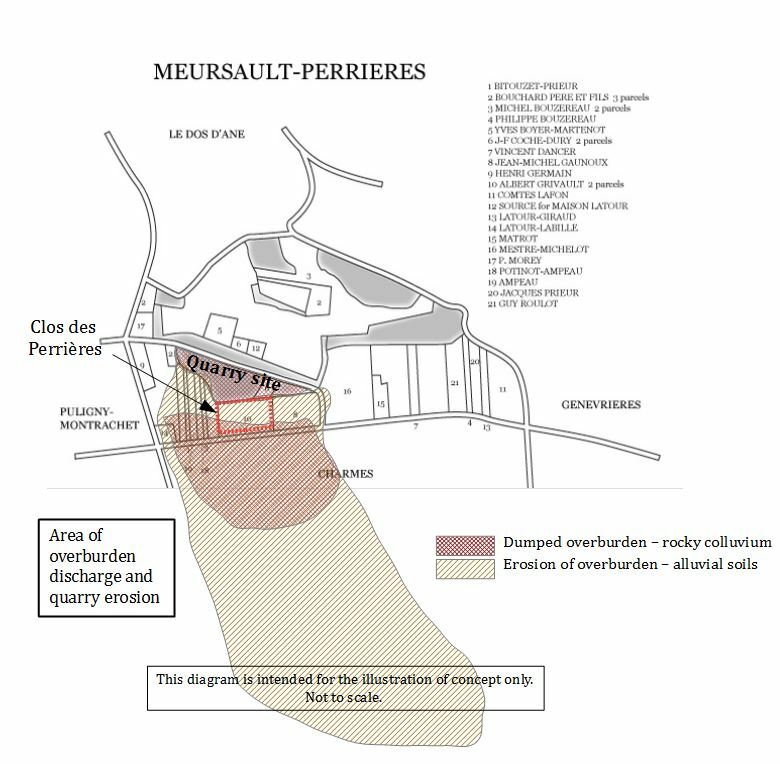 A large quarry was cut out of the hillside of Meursault–Perrières Dessous. The location of bulk of the excavation appears to now have been declassified from Les Perrières, as well as a wide strip above the exposed limestone wall. The sub-plot of Clos des Perrières which is owned by Albert Grivault vineyard is just below the main area of excavation, but it was certainly was part of the quarry itself. The area directly behind the removal site would certainly have been utilized for temporary buildings, for staging or even storage of limestone before transport, a loading area for horse carts, and space for any other logistical needs a quarry would require. The slope of this entire area was more or less leveled from it previous gradient. Clos des Perrières begins that the overburden would have been spread, although. The dirt roads of the regions were also impacted, by the transit of thousands of heavily loaded wagons, itself causing extensive erosion. And then it would rain. The sections of Les Charmes-Dessus, lying just below this quarry received the discharge of overburden, deepening the soil along this half mile of roadway. That this discharge and erosion onto Les Charmes Dessus, and no doubt Les Charmes Dessous, lying just below that, is without question. The soil depth was increased by the alluvial soils eroded from the quarry site, in addition to any normal erosional deposits that would have occurred, giving the vines more depth than they require, mimicking vineyards that are actually lower on the slope. The wines from Meursault Charmes, are fairly commonly described as fat, without the vibrancy and minerality of Les Perrières, and often given the faint praise of being rather hedonistic. Excavations by Thierry Matrot in 1990 in his parcel of Meursault–Perrières (parcel 15 in the map to the right) found roughly one foot of topsoil before striking the limestone base. Whereas, digging into his plot of Meursault-Charmes however proved to be far more work. Here a pit of 6 feet was dug before hitting the limestone substrata. (3) This indicates, a significant amount of limestone colluvium had developed in Charmes, that has mixed with transported clay to attain this six-foot depth of marl dominated soil.. I have not been able to determine the location of the Matrot’s plot (or plots) in Les Charmes. It is a large vineyard and without the dig location, this information doesn’t have nearly as much meaning as it would otherwise. It does illustrate the dramatic effect erosion has had on the vineyards of Burgundy and the character of the wines from each location. Much more on the effect slope position and soil depth on the character of wine can be here for vineyards on the lower slopes, and here for vineyards on the upper slopes. 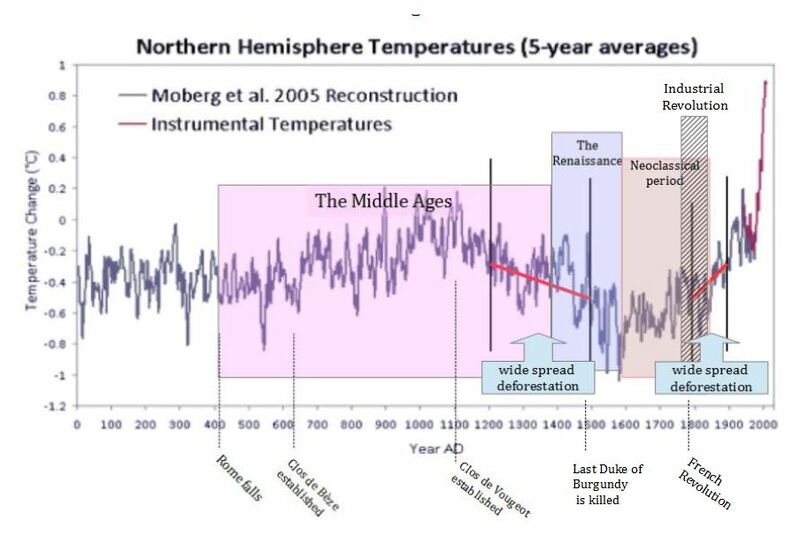 This diagram illustrates the changes in temperature in Northern Europe, as well as major historical in intellectual periods. (1) The Burgundians were an Eastern Germanic tribe which likely crossed the Rhine in 406 AD, in a combined force with the Vandals, Alans and Suebi tribes. The Roman forces there had largely departed four years earlier to deal with Visigoth king, and sometimes Roman ally, Alaric, who would ultimately be an actor in the fall of Rome. But the crossing signaled the end of Roman rule Central Europe. The Kingdom of the Burgundies, ruled the lands east of Paris, down to the Mediterranean with various boundaries. A series of smaller Duchy, including the Duchy of Burgundy, succeeded the Kingdom of Burgundies in 1032. The Duchy was relatively sovereign, but owed its allegiance to the French crown. The influence and power of the Duchy expanded greatly in 1384 with a union with the Hapsburgs. The house of Valois – Burgundy, the ruling family of the Duchy of Burgundy at the time, ultimately expanded its control of fiefs in Holland and the Netherlands, parts of northern France and Luxembourg. In a bid to gain independence from France, 1477 Charles the Bold was killed in battle by a combined force of the Duke of Lorraine and a Swiss Confederacy. With no heir to Charles, and a weak hold on their power, the Valois were unable to prevent the Duchy from eventually being absorbed into France.